Midland Solar & Air have been supplying and installing quality hot water systems since 1995 and are your local RINNAI® Authorised Specialists. We’ve seen many changes in the industry over the years as different manufacturers come and go. Through all the changes, one thing remains the same and that’s a quality product from Australia’s premier manufacturer. From Australia’s most efficient Solar system to the ever reliable Infinity Instantaneous range, whether it’s a new installation or replacing an old system, you can get into all the hot water you want with Rinnai form Midland Solar & Air. Get up to 90% or more of your hot water, free from the sun. These systems feature a tank mounted on your roof, above the solar collectors. Natural Solar Energy from the sun heats the water in the collectors, while the system’s natural thermosyphon function causes the water to circulate between the collectors and the tank, without the need for pumps. Rinnai® roof mounted Solar Hot Water systems are Australia’s most thermally efficient Solar HW systems and earn higher Federal Government rebates than any other brand, based on similar capacities. The systems are available with a choice of Stainless Steel or Glass Lined Tanks and Frost Tolerant Collectors are available for areas where frosts can occur. Systems can be supplied with your choice of electric or gas boosting with some models available in a range of Colorbond® colours, to suit your roof. 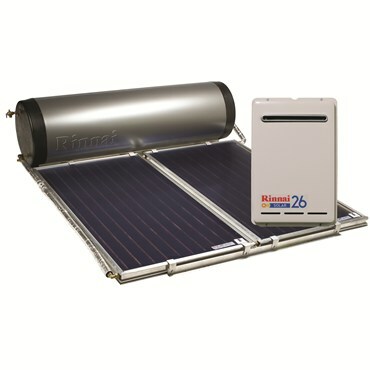 For lightweight roof structure, or applications where you don’t want the Hot water System’s storage tank on the roof of your home, a Rinnai® Prestige Solar Split System is the logical choice. The tank is located at ground level and connected to the collectors, by pipe-work. A small circulating pump returns the water from the tank to the collectors for re-heating, while a gas or electric booster is also available. 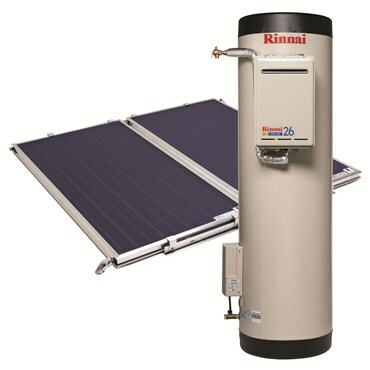 Rinnai® Prestige Split System Solar water Heaters earn the highest Federal Government rebate of any system with a similar tank size. 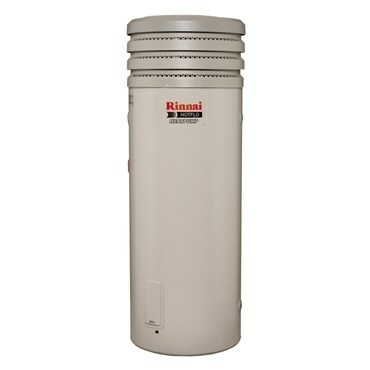 Rinnai® Hotflow Electric Heat Pump hot water systems use around 33% of the electricity that a similar sized electric storage system would use, to provide the same amount of hot water. Heat pumps use the same technology as an air conditioner, by gathering heat which is freely available in the outside air and using it to heat the water in the system’s storage tank. 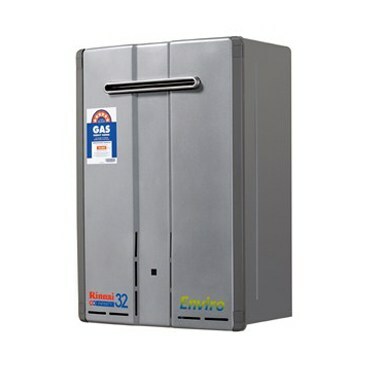 A small electric compressor is used to pump refrigerant through the system, resulting in a potential household energy saving of up to 25% on your overall power bills. Rinnai® Infinity Continuous Flow hot water systems never run out of hot water. By continuously heating the water as it is used, the Infinity only ever uses energy when you’re drawing water. No energy is wasted by heating water in a storage tank. With model capacities of 16,20,26 and 32 litres per second and a Energy Star rating of 5+, the Rinnai Infinity Continuous Flow series are fitted with low emission burners and are fully compatible with Efficient shower heads and outlets. At Midland Solar and Air we realise hot water systems can have a big impact on our environment. Our Rinnai range help reduce your carbon footprint. We stand by our product. The Rinnai 5-Year Parts and Labour Warranty applies to all hot water systems professionally installed by Midland Solar and Air in domestic premises in Australia, so when you choose a us, you do so with confidence. Minimise your exposure you to ever increasing utility bills. Let us help reduce the cost of heating your water.